At Blue Sky Smiles, we practice a preventive model of dentistry. We didn’t get into this business to sell expensive and unnecessary treatments. We do what we do because we genuinely about you and your family, and we want to help you achieve health, happiness, and confidence. We are dedicated to continuing education to stay current with the latest treatments and technologies and provide patient education to help you better understand your oral health and how it relates to your overall health and wellness. Oral hygiene is the foundation of a healthy smile. Without a good oral hygiene routine, plaque and tartar will build up, tooth decay will run rampant, and gingivitis will turn into gum disease. Did you know that slacking on your oral hygiene routine can actually increase your risk for serious systemic diseases?The health and cleanliness of your mouth is a direct indicator of the health of your body. Keep your defense strong by brushing and flossing regularly and maintaining regular cleanings and exams with your Saginaw dentist. Invest in an electric toothbrush. They really do clean better than a manual. We would be happy to recommend one for you. Brush for two minutes at least two times per day. Rather than “brushing your teeth” try to focus more on brushing between teeth and along and under the gum line. Use a soft bristle toothbrush and don’t brush too hard as it is easy to damage enamel and gum tissue. Hold the brush at a 45-degree angle and brush in small circular motions. Brush all surfaces of your teeth and reach all the way to the back. Don’t forget to brush the tongue or use a tongue scraper, as the tongue can harbor and redeposit bacteria shortly after brushing. This is also a great way to make sure your breath is fresh. Floss every day. Release a section about 12-18 inches and wrap around your middle fingers, using the thumb and index to guide the floss between teeth. Release a new section of floss between each tooth so you aren’t just transferring bacteria and plaque from one spot to another. Again, focus more on flossing your gums rather than flossing your teeth. Curve the floss in a c-shape around each tooth and under the gum line, rather than just snapping the floss up and down. If regular string floss doesn’t work for you, there are many alternatives to choose from including Soft-Picks® and water flossers. Rinse with water before brushing, after eating, and between meals throughout the day to help eliminate plaque, bacteria, and acid. Be sure to spit, don’t swallow! Avoid brushing right after eating or drinking, as the brushing motion combined with the acidity in the mouth can damage your enamel. Rinse with water instead, wait 30 minutes and then brush. Rinse with mouthwash after brushing and flossing to kill even more bacteria in other areas of the mouth, helping prevent decay, gum disease and bad breath. See your Saginaw dentist regularly for professional cleanings and exams. 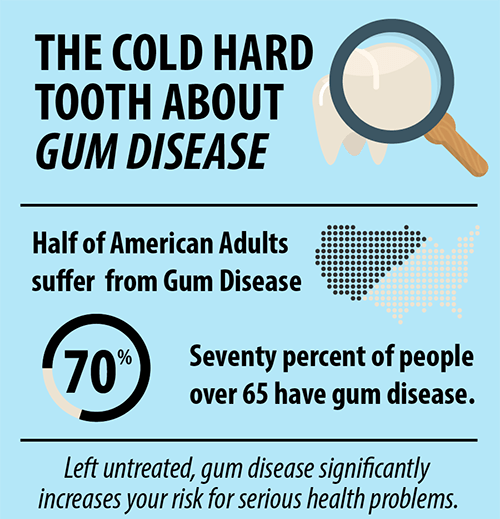 Did you know that over half of American adults suffer from gum disease (periodontal disease)? Did you know that gum disease is an infection that can cause tooth loss and contribute to heart attack, stroke, diabetes, and over 50 other serious systemic diseases? The bacteria in your mouth that cause gum disease have a direct pathway through the gums and into the bloodstream, where they travel through the body and into your vital organs including your heart and brain. While it may sound drastic, gum disease can ultimately be deadly. The good news is, it is entirely treatable and preventable with good oral hygiene and care from your Saginaw dentist. At Blue Sky Smiles, we’re proud to be on the cutting edge of dentistry, bringing the most advanced solutions back home to our patients in Saginaw, TX. We’re one of the only practices in the area to offer high-tech laser gum disease treatment with LANAP®. LANAP stands for Laser Assisted New Attachment Procedure and is the first and only FDA-cleared laser treatment for periodontal disease, backed by both clinical and laboratory research and results. Traditional gum disease treatments involve deep cleanings called scaling and root planing, and gum surgery for more advanced cases. LANAP allows us to provide a more comfortable, less invasive treatment, with better results than ever before. LANAP targets diseased tissue while leaving healthy tissue intact, and eliminates the need for sharp tools and surgical techniques, allowing for a less painful treatment and faster healing with little to no recovery time. Rather than just treating the physical symptoms of gum disease including plaque and tartar buildup, laser therapy actually treats the bacterial infection on a biological level, creating a healthier environment in the mouth so you don’t have to be treated again and again. LANAP can even help stimulate new bone and tissue growth to reverse the effects of gum disease and protect your teeth. 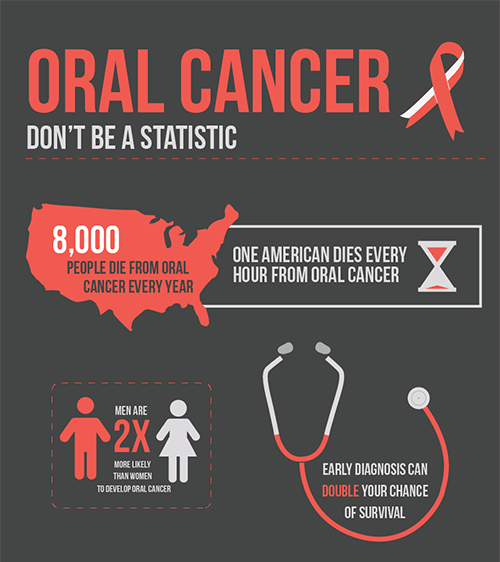 Oral cancer is unfortunately on the rise in the United States and is one of the most deadly forms of cancer because it is typically not diagnosed until late stages. New research finds that HPV is the leading risk factor for oral cancer, beating out tobacco and alcohol consumption combined. Most sexually active adults will contract HPV at some point in their life, so it’s worth considering your risk for oral cancer even if you don’t drink, smoke, or chew. Your Saginaw dentist is a unique position (inside your mouth) to detect and diagnose oral cancer. We screen all of our patients for oral cancer at each of your regular exams to ensure we catch any potential abnormalities before they develop. We are always on the lookout for signs of oral cancer, and you should be on the lookout for them at home as well. Come see us for an oral cancer screening today to get exceptional care and peace of mind. It might just save your life. *Can be found on the lips, cheeks, tongue, gums, throat, or any surface of the mouth. At Blue Sky Smiles, we believe your healthy smile is your greatest asset. Unfortunately, once you have all your adult teeth, they’re the only set you’ve got and can be easily damaged with a blow to the face or nightly teeth grinding. Thankfully, we offer custom mouthguards to help you protect your pearly whites for a lifetime of healthy smiles. If you or your child or teen is involved in any type of contact sports, we can provide a custom sports guard to help reduce the risk of injury. A custom mouthguard fits better and is more comfortable than a stock guard, so it is more effective and more likely to be worn regularly and properly. Custom mouthguards from your Saginaw dentist can help prevent tooth loss and minimize damage from concussions. If you clench and grind your teeth at night or suffer from bruxism or TMJ, a night guard can do wonders to protect your teeth and provide pain relief. Custom night guards are sleek and comfortable and have helped many patients minimize the damaging effects of excessive forces on the teeth night after night. Night guards can help eliminate tooth and jaw pain, and even help prevent chronic headaches and migraines. Schedule a visit to get started.